The mosaics at Wafi Mall is one thing that caught my eye. I wasn’t even supposed to be there, but the tour bus that would bring us to the desert for the sunset tour picked us up from here. Mosaics at Wafi Mall in Dubai. There’s no doubt that Wafi Mall is the Little Egypt in Dubai. The building itself has a pyramid-shaped dome that protects this set of impressive mosaics, depicting life of ancient Egypt. Too bad, the receptionist who works right under these mosaics doesn’t even know the artist who made this art possible. Mosaic at Wafi Mall in Dubai. Outside the Wafi mall, they’ve got massive statues of Egyptian gods and goddesses, too. And in the evening, don’t miss their light and sound show. Wafi Mall isn’t really a tourist attraction in itself but just in case you’ll be joining in one of the sunset tours in the desert, go earlier than its scheduled departure from here. Look for these impressive mosaics and don’t miss the fabulous bazaar on its basement floor. 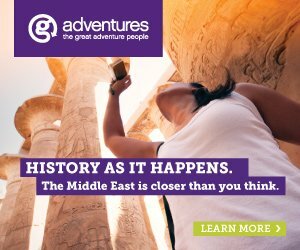 Middle East is Closer Than You Think!